Welcome to our full live coverage of stage 10 of the Giro d'Italia, a long rolling stage from Penne to Gualdo Tadino. Buongiorno! Early start today at the Giro d'Italia and that's because we have no fewer than 244 kilometres to cover on stage 10. That's just 13 shy of this year's Paris-Roubaix. Yes, it's a brutal re-introduction after the second rest day yesterday, made all the more complicated by a couple of early climbs, and plenty of rolling terrain thereafter. The riders are due to roll out of Penne (trying to establish any links with the pasta) at 10:50 local time, with the race proper due to get underway at 11, so in around 25 minutes. Rest days can be disorienting not just for the riders but for the casual cycling fan. Don't get caught short today - get back up to speed with our rest day recap. It's not just the whole Team Sky squad; turbo trainers are a common sight at the team buses this morning. Everyone, it seems, is respectful/fearful of this very early second-category climb to Fonte della Creta. A chaotic start is expected thanks to that early climb, which could pose significant problems to anyone who hasn't judged their rest day well. It's followed by another categorised climb, at Bruzzolana. Things should settle down somewhat thereafter but the terrain constantly undulates, and the chances of a mass sprint finish are complicated by the lat Cat-4 climb at Annifo. It's anything but straight forward. The flag drops and the racing is underway. Attacks flying off already. There's going to be a huge fight to get in the break today. As soon as a few riders go clear and look like forming a group, others ping off from the peloton. 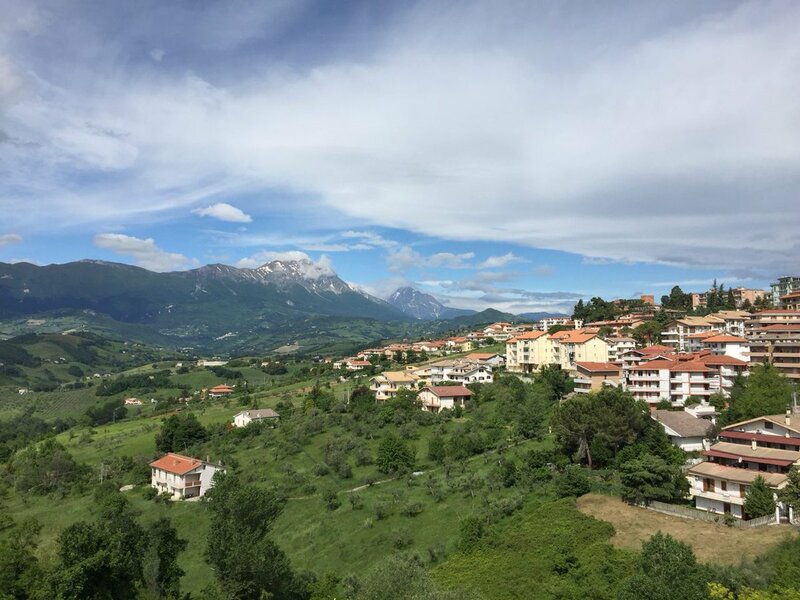 We've checked with our resident Italian Stephen Farrand - our European Editor who's lived in Italy since the mid-90's - and he sadly informs us that the town of Penne has nothing to do with the pasta. It is, though, he says, a former roman town famous for its goat cheese and cured meats. There you have it. There's a large group out front now, with a few riders chasing. The group of 13 riders has been joined by three chasers to make 16. Giulio Ciccone is still chasing but it's not looking good for the young Italian. The breakaway riders have a lead of around two minutes as they hit the foot of this early Cat-2 climb. Ciccone is a hugely promising climber and the road heading uphill works in his favour as he closes the gap to the leaders. He's joined them now, making it 17 up front. As the pace increases in the peloton on this climb, maglia ciclamino wearer and double stage winner Elia Viviani is one of the riders distanced. 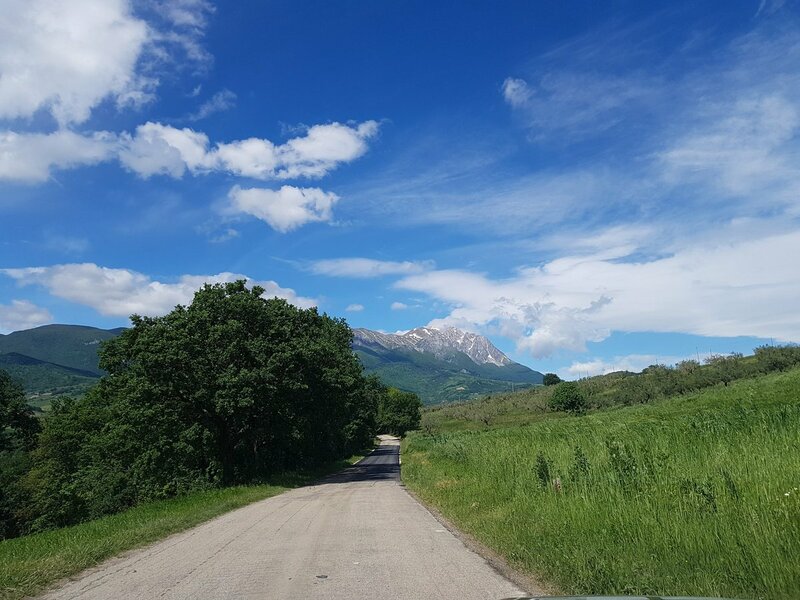 There's a little added motivation for Ciccone here as this climb heads up to Rigopiano, site of a tragedy last January as an avalanche struck and killed 29 people. Ciccone is from the region, and attended a memorial service yesterday on his rest day. Fernandez, Mosca, Pedersen and Schmidt have been distanced on the climb as the break continues to work with an advantage of 1:45. Ciccone reaches out at the top and takes the KOM points. Here he was at the start this morning, honouring the victims of the Rigopiano tragedy. That will mean a lot to him. The peloton comes across the top of the climb 1:10 in arrears. Scully, Mosca, Fernandez, Schmidt, and Pedersen have all been swallowed up by the peloton, leaving 12 riders out front in the breakaway. Mohoric has flown down this descent and has opened a gap over his breakaway companions. We're hearing that Mitchelton-Scott's Esteban Chaves, third overall, has been distanced by the peloton, which is being led by Team Sky. Exact time gaps are hard to come by at this point. Remi Cavagna (Quick-Step Floors) and Pello Bilbao (Astana) have attacked the peloton. An interesting move. Bilbao is in the top 10 on GC and therefore a big threat, while Cavagna going means Quick-Step have surely given up on trying to bring this one back for Viviani. The road continues to dive downhill as we pass the 200km to go mark. Mohoric is brought back at the head of affairs, Cavagna and Bilbao closing in. Peloton at just under 2 minutes. Confirmation of Chaves' deficit crackles over race radio and Sunweb hit the front of the peloton. This is a big development. There's always someone who gets it wrong on the rest day, and it seems Chaves has fallen into the trap. It leaves Mitchelton-Scott with a headache, as they've got a pink jersey to defend, and can't put all their resources back with Chaves. The leaders are about to start the second climb of the day, the short Cat-3 haul to Bruzzolana. Still no confirmed time gap back to Chaves. It seems he has one teammate with him in Sam Bewley, in what is the fourth group on the road (Breakaway - Cavagna/Bilbao - Peloton - Chaves). Fabio Aru's UAE teammates now chipping in on the front of the peloton. The gap to the break is just 1:15. The Colombian has lost considerable ground and is 3:35 off the front of the race. That means he's more than two minutes down on the peloton, where the rest of the overall contenders are. Ciccone, the strongest climber in the break, once again takes maximum points at the top of the Bruzzolana climb. Any whispers of leadership headaches within Mitchelton-Scott appear to be flying out of the window. Chaves appears on Italian TV station Rai's pre-race coverage and says "There's one leader and that's Mitchelton-Scott." At the end of today, it might well be all in for Yates. Thibaut Pinot's Groupama-FDJ teammates join the party at the front of the peloton now. All the other GC teams are uniting behind a common goal here. They stand here to take a major rival out of the picture and slash Mitchelton-Scott's tactical advantage in having two cards to play. Despite the pace-making in the peloton, Chaves doesn't appear to be losing any ground for the time being. 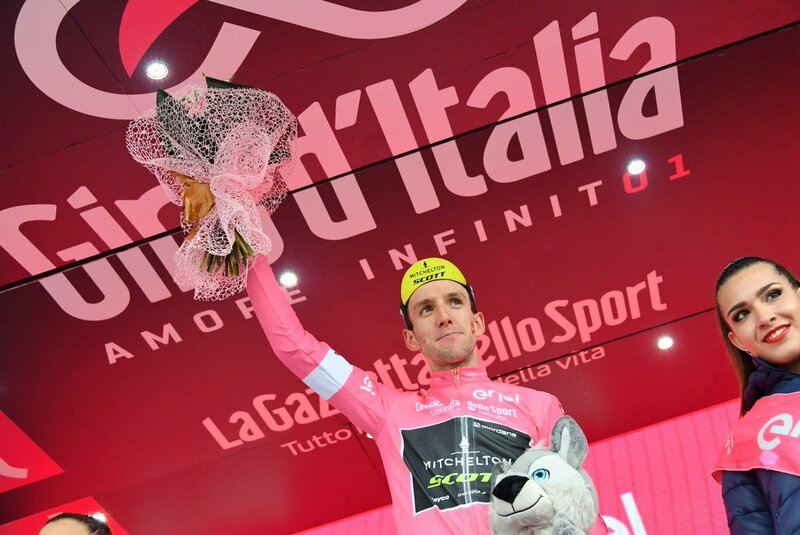 "At the start of the day, we discuss the tactics on the bus, but cycling is a crazy sport, and sometimes things don't go to plan," Simon Yates said yesterday in his rest day press conference. "Etna was not planned. Esteban was not supposed to be in the break, and I was not supposed to go across to him in the end, but sometimes it happens like that." And sometimes it happens like this... You can read our full story on Yates and Chaves from the rest day, at the following link. The peloton are closing in on the breakaway here. 30 seconds is the gap. With the gap coming down quickly, Tony Martin and Krists Neilands have attacked from the break and are going it alone. All the other breakaway riders have been taken in by the peloton. Martin and Neilands have an advantage of one minute over the peloton. It's raining and Martin is taking care as he takes on a sinuous downhill section. He's holding his gap of one minute as Sky lead the peloton. Louis Meintjes' terrible Giro continues. The Dimension Data rider is with Chaves in the third group on the road. We predicted a chaotic start and that's exactly what we got. Now things have settled into some sort of pattern, here's the race situation. We're constantly updating the race situation on the right hand side of your screens. When you see Tony Martin out front on his own, you can't help but think back to the 2013 Vuelta. The German embarked on a solo breakaway on stage 6, going clear pretty much from the gun. Some 175km later, he was caught by the peloton... just 20 metres from the finish line. Heartbreak. Here's our report from that day. Mitchelton-Scott have sent a rider back to Chaves, who is now tucked in behind three teammates. They should be able to limit the damage for a while but they're up against a committed peloton with far more firepower. Chaves is flailing here, but Chris Froome has been flailing since this Giro began - since just before it began, even. The four-time Tour de France champion sat down with the press yesterday on the rest day and said his crash in the recon of the opening time trial has held him back ever since. Asked if he still believes he can win this Giro, his response wasn't such a confident one. After extensive discussions with his team over race radio, Tony Martin decides against a repeat of his 2013 Vuelta epic, and sits up to be reabsorbed by the peloton. The catch is made but there's no let-up in the peloton. FDJ, Sky, Sunweb, Bahrain, LottoNL (everyone, pretty much) exchange turns on the front as they seek to keep Chaves at bay. Simon Yates has two teammates with him in the peloton. Chaves has three with him behind. It appears that the remaining member of the Mitchelton-Scott squad, Svein Tuft, is in the gruppetto. A lifeline for Chaves in the form of Quick-Step. The Belgian team have Elia Viviani in that group, and are starting to assist in the chase. The gap is down to 2:05. Quick-Step have four riders in front of Viviani in this chase group, and they're taking control here. 1:58 the gap. A really fascinating tussle playing out here. GC teams vs Chaves and Viviani teammates. And we've still got 129km left! The sheer length of this stage provides me with a slightly tenuous link to the Spring Classics... which are the subject of our very first documentary film. 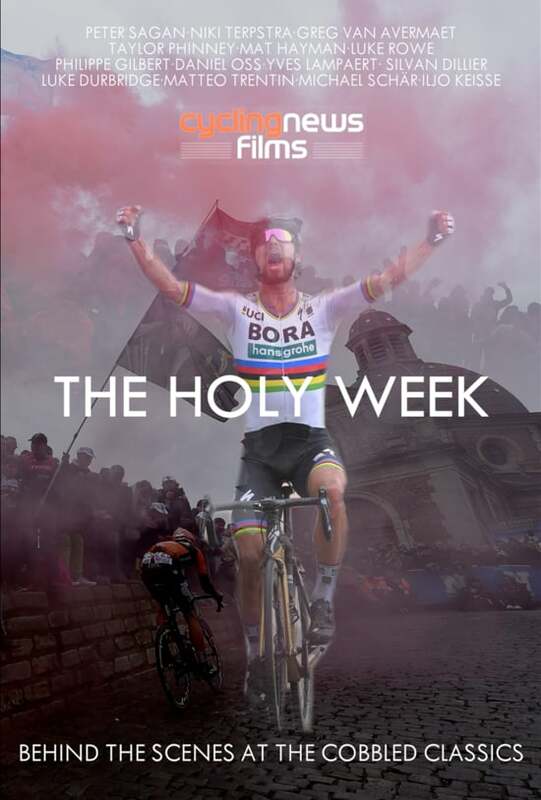 If you haven't seen it yet, The Holy Week takes you behind the scenes at this year's Tour of Flanders and Paris-Roubaix, and is available to buy or rent at this link. Big swing here as the latest time check puts the Colombian at just 30 seconds. Cavagna, Senechal, Stybar lead the chase group. They're working for Viviani but have helped save the day here for Chaves and Mitchelton-Scott. Or have they? It seems the Giro's timings are all over the place, and the latest check shows Chaves/Viviani still at 1:15. The gap is rising again. 1:51 is the latest check as the riders take on another gentle swooping descent. It's Robert Gesink leading the peloton, teammate of George Bennett, who's seventh overall. Behind him are two representatives from Sky. The gap has stabilised at 1:50. Quick-Step still with four on the front of the chase group. Chaves' teammates are leaving it to Quick-Step here. 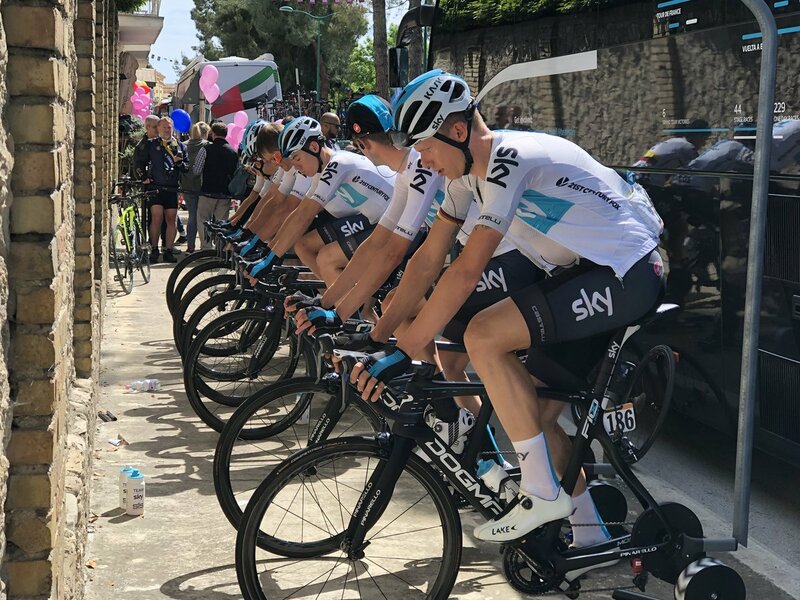 They've done a lot of chasing already today and indeed over the past few days as they've helped control the peloton for the pink jersey of Yates. Tired legs, no doubt, but they can't sit back, as the gap is going out again. 2:20 now, and this is slipping away from them again. Talk of a Chaves crash early on have been debunked by Mitchelton-Scott DS Matt White. The latest rumour is pollen/allergies. We'll have to wait until the end of the stage to find out exactly how he came to be dropped. As the gap yawns out to 2:30, Quick-Step disappear from the front of the chase group. Have they called it a day? It seems so, as replays show the blue jerseys exchanging words before easing up. That's just about the worst news for Chaves and Mitchelton-Scott. They have no option but to hit the front of that chase group now, and even Chaves himself comes through for a turn, as Bewley pants behind. Big moment - this could be game over for Chaves at this Giro. Kreuziger and Juul-Jensen are the other Mitchelton-Scott riders with Chaves. They're still riding but the gap has gone out to 3 minutes. There are still 95 kilometres left to race here. Is 95km of full gas chasing going to be worthwhile, when this now is surely a situation beyond rescue? Cruel as it may be for Chaves, Mitchelton-Scott may well have to call this off and save the resources of Kreuziger, Juul-Jensen, and Bewley - they still have the pink jersey to defend, and some mightily tough stages coming up. We have an intermediate sprint now, which holds bonus seconds of three, two, and one for the first three across the line. Normally these are shared among the break but today there is no break and that means the GC riders can get involved. Pinot looks interested, as does Yates. Pinot is effectively led out by a teammate, but Yates is on the wheel and springs away to take it at a canter. Three bonus seconds for the Brit, who extends his overall lead. Two bonus seconds for Pinot over the rest. Third place went to Androni's Marco Frapporti, who has used this opportunity to try and launch a new breakaway. He's alone now at the head of the race. Chaves crosses the intermediate sprint line 5 minutes down. I think we can say with some certainty now that today has been a terminal blow to his hopes at this Giro. Frapporti leads the race by 30 seconds. He's all alone, with 84km left to cover. The gap to Frapporti goes out to a minute. The Italian surely won't win the stage, but he is extending his lead in the Fuga Pinarello standings - for those who've spent the most kilometres in breakaways. Frapporti was on 386 at the start of the day and that's ticking up all the time now. It seems Sam Bennett is in the peloton, which would make him a favourite for the stage win today. Bora-Hansgrohe aren't working at the moment - it's FDJ - but they surely will later on. Frapporti now has two minutes over the peloton, with Chaves at eight minutes. "If I had to bet on someone, I'd bet on myself." More gold from Fabio Aru, whose confidence appears to be in no short supply despite him being 15th overall, 2:36 down. 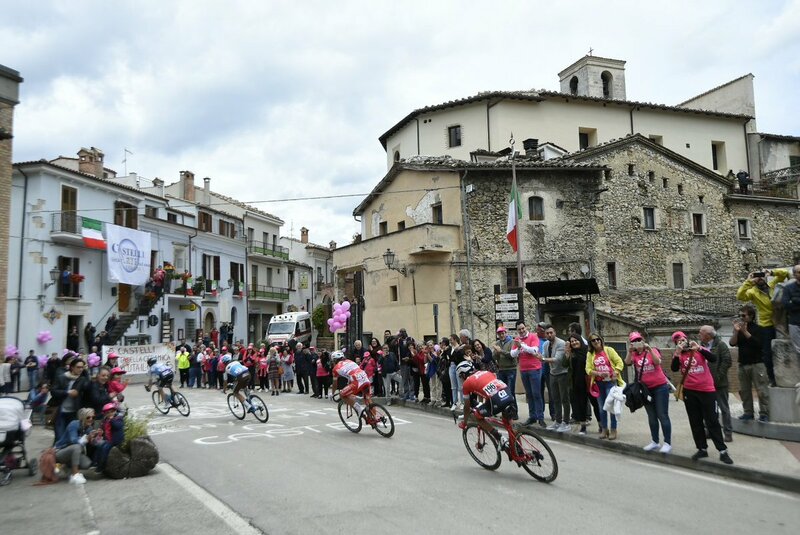 For more from the Italian champ, along with updates on Richard Carapaz and Pello Bilbao, check out the latest edition of our Giro d'Italia News Shorts. A shot of Chaves before the plug was pulled from that chase. With 55km left to race, Frapporti leads the race by 2:30 over a peloton which contains all the GC contenders apart from Esteban Chaves, who's in a group with Elia Viviani that's now some seven minutes adrift of the peloton. EF-Drapac have put Dombrowski on the front of the pink jersey group, but their sprinter Sacha Modolo is not there - he's back with Viviani and Chaves and therefore out of the picture. The riders are heading towards the late Cat-4 climb to Annifo. The climb hasn't officially started yet but the legs are being sapped by a lengthy section of false flat. Here's a reminder of the stage profile. The rain capes are coming back on. It's been coming down pretty much all day at the finish. Away from the Giro, we also have WorldTour racing happening over the Atlantic at the Tour of California. Team Sky's Colombian prodigy Egan Bernal won at the Gibraltar Road summit finish yesterday, with a time trial on Wednesday set to further shape the overall classification. For all of our content from the Tour of California, including race reports, results, photos, video highlights, news reports, and analysis (we're taking it seriously...), click here. Frapporti grimaces as he heads under the 40km to go banner. He still has a lead of 2:30 but knows the stage win is unlikely in the extreme. Still, he's earned plenty of exposure out there for his Androni Giocattoli-Sidermec team and their sponsors. Davide Villella (Astana) attacks from the peloton they themselves pass through the 40-to-go banner. Matej Mohoric, who was in the original break earlier today, has pinged off, as has a rider from UAE, and another from Astana. Bora will have to do some work now, surely. It's up to them to keep a lid on things here in order to bring about a bunch kick for Bennett. AG2R and Lotto Fix All have put a rider each up there, along with another rider from Androni. It's Nico Denz for AG2R, Davide Ballerini for Anrdoni, Victor Campenaerts for Lotto Fix All. Also a Movistar rider up there, but it's coming back now. Mohoric, in the drops, catches Villella, who nips straight into the slipstream of the Bahrain-Merida man. They'll work together here in pursuit of Frapporti, who's lead has come down to 1:30 thanks to this flurry of attacks. The rest of the attackers have been brought back so it's just Villella and Mohoric off the front of the peloton, but they only have a slim advantage of 20 seconds or so. Bora put a rider on the front now. Villella and Mohoric are rapidly closing in on Frapporti, who must be tiring after nearly 60km out front on his own. Villella and Mohoric catch Frapporti, not even looking at the Italian as they forge on. Frapporti tucks into the wheel, where he's likely to remain for much of the remainder of this stage. The leading trio are coming towards the top of this Cat-4 climb at Annifo. The gradients kick up in the final few hundred metres and that spells curtains for Frapporti, who simply can't live with the pace of these fresher WorldTour riders. Two left out front. Back in the peloton, Ciccone, who was first over the two early climbs today, skips away to take the remaining point at the KOM. Sergio Henao was also up there looking interested. The pace has increased in the peloton and Villella and Mohoric count on a lead of just 21 seconds. A shot of Frapporti before he was pegged back. Mohoric is the superior descender and he's dropped Villella. Nico Denz has pushed on again and he's up ahead of the peloton with Sergio Henao and Alessandro De Marchi just behind. Denz is really pushing on down this wet descent. Richard Carapaz is off the back as the peloton splits on this descent. As Mohoric dives under the 20km to go banner, Villella is almost back on. Denz has made up plenty of ground, too, and is not far off himself. Denz latches on and almost takes out Villella as he comes round on a hairpin. The AG2R rider is straight onto the front and Villella is off the back again. The 2017 champion gets a quick bike change but now he faces a tricky chase on a treacherous descent. A teammate duly drops back to assist Dumoulin in that chase. Replays shows the Dutchman went wide on a bend and unclipped - a puncture, perhaps. It's Sam Oomen pacing Dumoulin back, though more assistance now comes in the form of the slipstream of the Sunweb car. Henao and De Marchi are still working together in pursuit of the leaders, though they only hold a small advantage over the peloton. Dumoulin is back in the peloton. Panic over. Denz, Mohoric, and Villella are back together out front as the road flattens out and even kicks up again. The latest time check shows the peloton at 1:20. That really shot up on that descent. Another short section of downhill sees Mohoric distance Denz and Villella once more. Another Androni rider has attacked the peloton but he's not getting anywhere. What have Bora got here? Not much, it seems. They've one rider on the front and the gap isn't coming down. Impressive stuff here from Denz, who rides away from Villella and links up with Mohoric once more. Meanwhile Henao and De Marchi are losing ground - they're 35 seconds down now. Androni are indefatigable today. Another attack from Gianni Savio's Italian Pro Conti team. Just 10km to go now and it's Mohoric and Denz leading the race. Villella is several seconds behind, and then Henao and De Marchi 20 or so more seconds behind him. The peloton, meanwhile, is 1:06 off the front of the race. 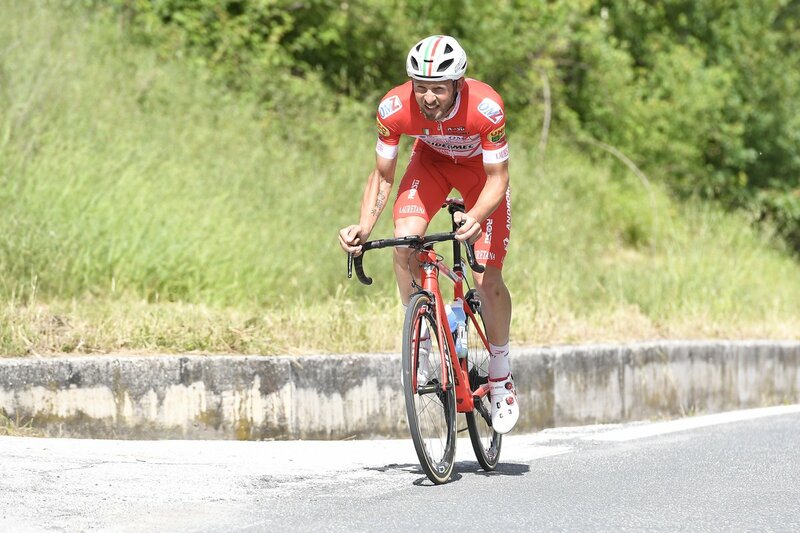 Andrea Vendrame is the latest Androni rider on the move. We've seen him in the break already at this Giro. He has his arms folded over his bars but he's not getting very far. Henao, still wearing his decidedly un-aerodynamic rain cape, is still giving it everything with De Marchi, but theirs looks a futile cause. They're 46 seconds off Mohoric and Denz now. 7km to go now and Mohoric and Denz may well fight it out for the stage here. They have 1:16 over the peloton, where Katusha and EF are working. 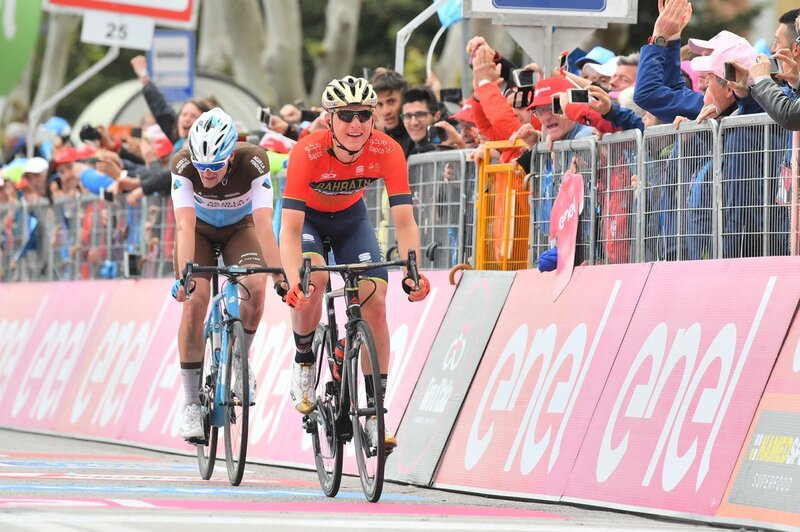 Mohoric won a stage of the Vuelta last year and victory here would slot right in alongside that on the talented 23-year-old's growing palmares. Denz, himself only in his third season as a pro, is searching for his first ever win. Just under 5km to go now and De Marchi and Henao are caught by the peloton. 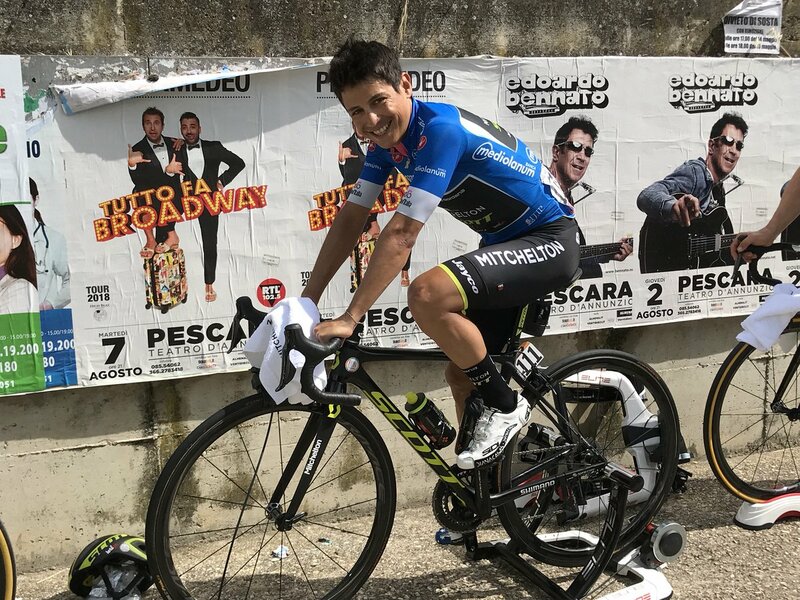 Meanwhile the game is surely also up for Villella. Mohoric and Denz continue to collaborate to the time being. With just under a minute in hand, one of them will be walking away with the stage win, provided they don't start playing cat-and-mouse too soon. Lotto Fix All take it up in the peloton. 50 seconds the gap with just over 3km to go. Mohoric and Denz swap turns and exchange words. Another downhill section sees Mohoric get back into that aero tuck. Denz gets into his and makes sure not to lose the wheel this time. Denz staying calm on the wheel. He's in the best position here. Here comes Denz, but he can't come round! Sam Bennett sprints from the bunch to grab the final podium spot. All of the GC favourites finished safely in that bunch. That is, apart from Esteban Chaves, who will be out on the road for another 15 minutes on what has been a terrible day for him and Mitchelton-Scott. Denz did everything right there - he just didn't have the legs. He allowed Mohoric to lead through the final kilometre and was able to stay in the slipstream as Mohoric wound up his sprint. As he made his own surge and dived out into the wind, it still looked good as he began to draw up alongside, but precisely at that moment, when they were neck-and-neck, he began to fade, and Mohoric found a second wind, taking him to the line, where he raised both arms above his head. Beyond the line, a sporting handshake between the two. Simon Yates keeps the pink jersey, and even extends his lead after taking those bonus seconds at the intermediate sprint. After Chaves' demise, Tom Dumoulin is up to second overall, now at 41 seconds, with Thibaut Pinot third at 46 seconds. "I’m super happy - not just for me but for the team. They gave me this opportunity even though Domenico [Pozzovivo] is feeling very good for the GC. He gave me a free pass today to play for the stage win, and I’m super happy for it. "I was not super confident, that’s why I tried to attack him [Denz] several times in the last 10km, but then he collaborated, even though I attacked him. So I decided to risk it all for the final sprint. I was not super confident but when I saw he was not pacing me, I had even more power and tried to go all the way to the line." Stay with us here for post-race quotes and reaction, along with the first photos coming in from the finish. An eventful day, and much to dissect. The big storyline today is undoubtedly Esteban Chaves, who plummets out of contention having started the day second overall. 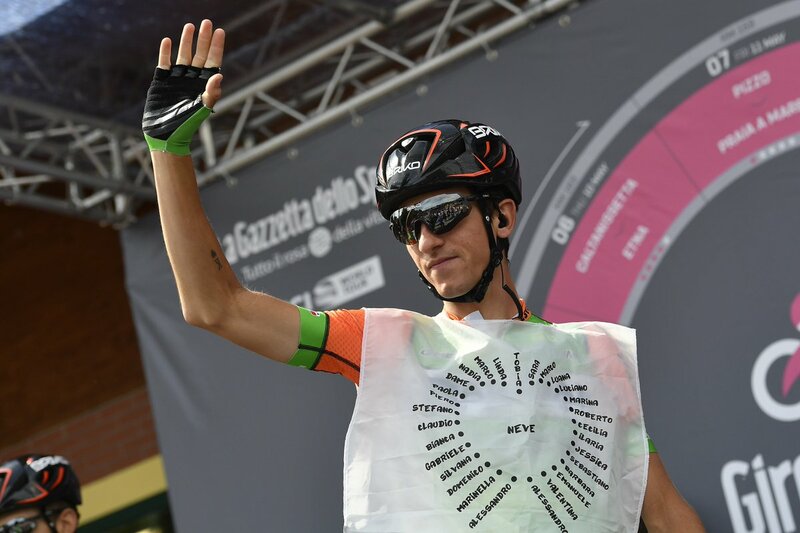 The Colombian, we remind you, was dropped on the early second-category climb to Fonte della Creta and, after a prolonged attempt at a chase, waved goodbye to his hopes at this Giro. Teammate and race leader Simon Yates and team DS Matt White have both spoken about what happened to Chaves, and will being you their input in a moment. "He just had a bad moment in the first climb of the day," says Yates of Chaves. "Straight out of the rest day you don't know how the body responds. He just had a bad moment and like that, it's over. It was a really hard chase. I know he's worked extremely hard for this. Maybe he can bounce back and get a few stage wins." Asked if his tactics now change, he says: "No, I was going to approach the race exactly the same. There are many more difficult stages to come. We'll see how that goes." "I haven’t spoken to him since we passed him in the race but in the last couple of days he’s had a scratchy throat with allergies. When I talk to him at the finish, we’ll know the real details. He didn’t crash and he’s not sick or injured, so I’m presuming he had problems with allergies. There’s a lot of pollen around. "For Esteban it was a bad day. Now his chances of general classification have gone. But look, Simon is still in a very good position and now all of our energy will turn to looking after him and keeping the maglia rosa." Here's our report page, where you can find a write-up, results, and photos. More from Yates, this time on his sprinting for the time bonus at the intermediate. "I was going to go for them as well, but I saw Pinot lining up with the team to do a lead-out for the sprint. I came behind him and managed to beat him in the sprint. "I don’t need seconds on Dumoulin before the time trial - I need minutes," he later adds on Italian TV. "For sure two minutes will be the minimum, closer to three minutes would make me more comfortable." "That’s the Giro," says the Colombian. "I’ve got a difficult relationship with Italy - it’s love and hate. Just a few days ago I enjoyed one of the best days of my career and now it’s hard for my morale. But that’s life, we can only do our best. The important thing is that we’ve still got the leader’s jersey. Our plans won’t change. "We’ve still got to understand my problems. I just didn’t have the strength and couldn’t stay with the best on the first climb. We tried to chase with the team and got to within one minute but it didn’t work out. "Our goal doesn’t change as a team. We started with the idea to win the Giro and we’ll continue with that plan." "At the end there I was on the limit. He deserves it. He deserves it. But frankly I'm disappointed. 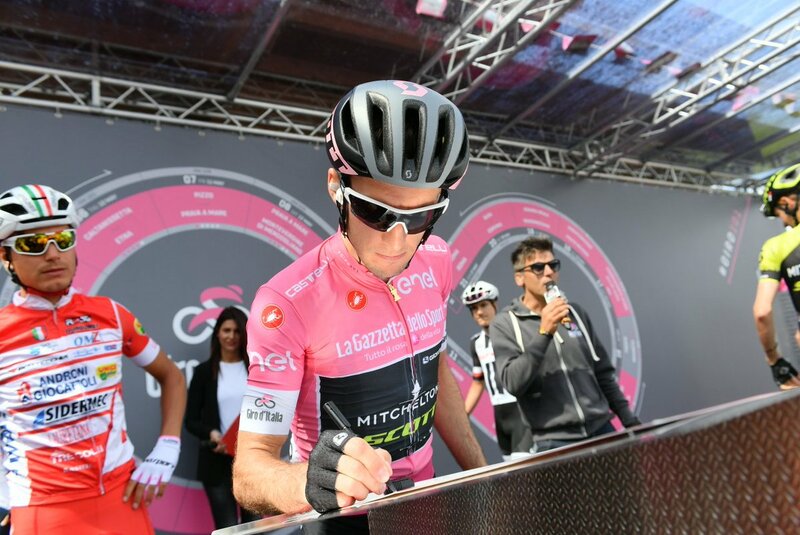 "I've felt very strong at this Giro. The team said that today if I wanted to do something, it was a good day to do it, because the sprinters were dropped and it was mainly climbers. I came very close. It's a big disappointment. "I was behind him, and he launched his sprint at the moment I wanted to launch mine, and then he was just too strong. We were side-by-side, but he won because he was stronger." Here's Richard Carapaz, who had a late puncture and a moment of panic but got back on and finished safely in the peloton to retain his place on the top five. "I had a flat tire today, but thanks to the team I got a new bike and I could get back on," he said. "It's been a very hard stage. Also we had some surprises on how hard it was in the finale, but in the end it all went well." The full results are in and we can tell you that Esteban Chaves - and Louis Meintjes for that matter - crossed the line some 25 minutes down on the peloton. That leaves Chaves 39th overall at 25:26. That's it for our live coverage today. We'll have all the talking points covered with in-depth reaction, news stories, and analysis to come on Cyclingnews.com in the coming hours. 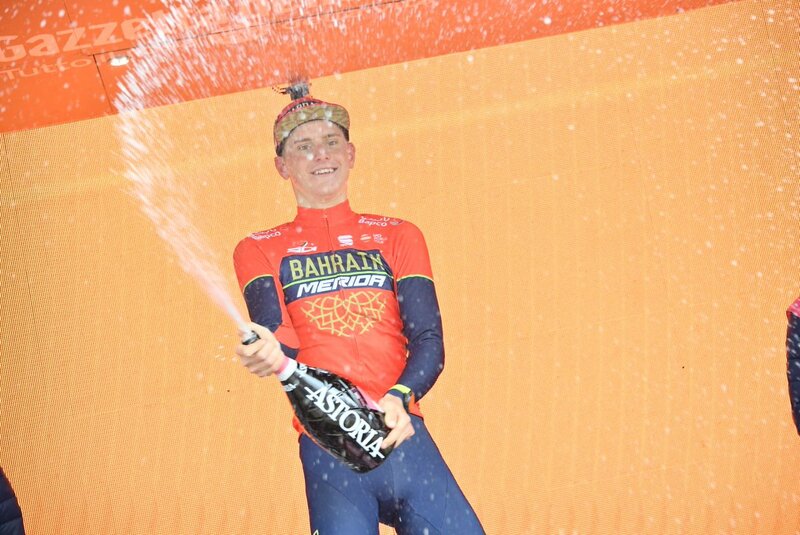 In the meantime, I'll leave you with our stage report and a photo of the day's winner, Matej Mohoric. Thanks for joining us today - extra points if you were there for the full 244 kilometres, and full marks if you did the build-up and debrief, too. Let's do it all again tomorrow. Ciao.